Kiln dried logs Wantage deliveries are free and made from our yards near Abingdon and Faringdon. Our kiln dried logs are premium quality, bringing us many long-standing customers in the villages around Wantage. Our aim is to keep the environmental impact of log burning to a minimum. All of our firewood is kiln dried premium quality hardwood, primarily Beech and Ash. Our timber is locally sourced and dried, helping to keep mileage down and maintain a lower carbon footprint. The kiln drying process also produces timber which burns cleaner and hotter, producing less pollution. The kiln itself runs on scrap wood left from log processing, again reducing waste and using fewer resources. Our kindling is also extremely high quality and is produced by the same process. If you are using a modern DEFRA approved appliance you will find our logs burn easily, with an extremely high heat output. This ‘clean burning’ helps reduce emissions and is more cost effective for you, requiring fewer deliveries and a more cost effective way of heating your home. Deliveries to the town and the surrounding villages of Grove, Letcombe, Ardingdon, Challow and Hendred are completely free. See our map for more details, but if you think you are just outside the area, please give us a call. Our delivery charges are competitive and we may be already delivering close to your location. 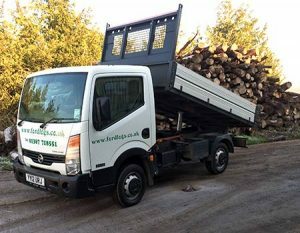 Our logs are delivered from a small truck, and are delivered promptly and reliably at a time agreed with you. Firewood is delivered loose and we can offer a stacking service from £15. We also construct and supply custom made log stores to help keep your firewood in top condition for burning all winter. Kiln Dried Logs now in stock for immediate delivery to Wantage. ORDER NOW!